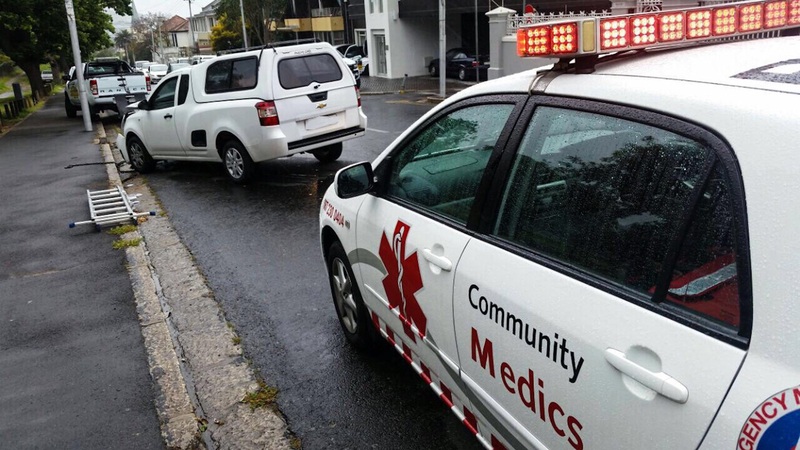 Community Medics attend to a motor vehicle accident this afternoon on the corner of Camp and Upper Orange street in Tamboerskloof. The collision left the 2 occupants of the bakkie injured and requiring transport to hospital. The accident took place when a Mercedes Benz collided with the bakkie while it was waiting to turn through the intersection. The driver of the car managed to escape without any injuries. Community Medics urges drives to remain vigilant on the wet roads and to drive with their headlights on.